Oh man, this was a gooooood dinner. Like, really really good. We felt like we were eating a fancy brunch in a restaurant when we had this - something that we never do anymore, but I definitely miss! The waffles are of the savory variety, containing just a little sugar. They have cornmeal to give them a nice texture, and chives and cilantro for more flavor. Topped with homemade salsa and a poached egg, this was really and truly one of the best dinners we've had in a while. And speaking of poached eggs, this was my first time attempting them. I'm happy to say that I had great success thanks to Deb of Smitten Kitchen and her step-by-step tutorial (and thanks to my pal Annie for recommending the tutorial)! My eggs weren't the most beautiful poached eggs ever, but they were definitely tasty. I topped the whole thing with some freshly cracked black pepper and a sprinkle of chives and cilantro. I considered adding cheese to the waffle batter, but it really isn't needed. And I suppose if you really wanted to go crazy, you could sprinkle some bacon over the top. But I personally think this meal is pretty perfect as is. Make this this weekend. I promise you won't be sorry. Preheat your waffle iron as you mix the batter. Preheat the oven to 200 degrees and place a baking sheet inside. In a large bowl, whisk together the flour, cornmeal, baking powder, sugar, baking soda, salt, black pepper, and cayenne. In a medium bowl, whisk together the butter, eggs, buttermilk, and herbs. Make a well in the dry ingredients, and add the wet ingredients. Stir until just combined - there will still be lumps, and that's okay. Cook waffles according to the directions for your particular waffle iron. Keep warm in the oven as you cook them all. 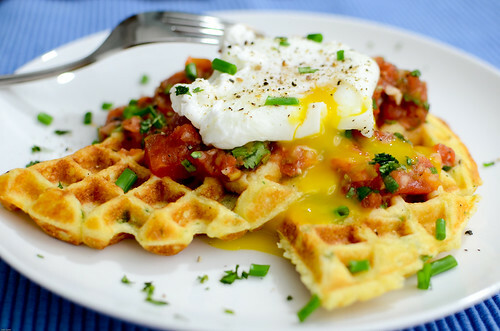 To serve, top each waffle with salsa and a poached egg. Sprinkle with additional chives, cilantro, and season with pepper. Serve immediately. I made savory waffles way back in my early days of blogging and topped them with refried beans and salsa, I believe. They were great and it felt nice to use my waffle iron for something other than breakfast. What a yummy sounding recipe! I love the idea of a savory waffle! Gorgeous plate of food! That is so colorful. You had me at poached egg! I could eat cardboard with a poached egg on it. But a savory waffle probably tastes a lot better. I love this idea. How delicious! This is fabulous. I always want eggs with breakfast, but don't always want a super sweet waffle! There's this restaurant in my college town that makes the most AMAZING cornmeal waffles. Seriously, if you're ever in the SF bay area, you have to try Brown Sugar Kitchen! I never could figure out how to make these waffles, but I'm definitely going to try this recipe out! It sounds just as good! My first race is next weekend...and I think this would be the PERFECT way to celebrate! Now this would make for a tasty breakfast!